QuickBooks time tracking features helps business owners to track and record time spent by employees, supplier or clients on a service item. 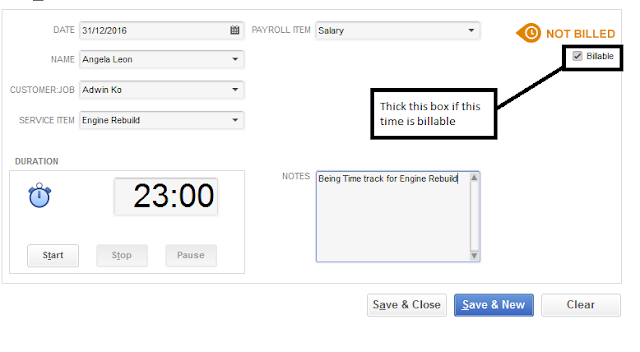 This feature allows you to attach a bill when creating an invoice or generating bills on time. You can use these functionality alongside billing rate level for employees' payroll management. Account Payable, Account Receivable, Payroll, Purchase order, Inventory and General ledger. Click Start to activate this single time tracker and click Save and close. Click No to keep the time tracking on for your service item. As per my knowledge Quickbooks have stopped the service from a very long time. Even the time was there when I was a genuine user for Quickbooks, but with the time frame again with the shut down of the service I opted to go with the integrated version of the same. The best solution I found out for the same purpose is the cloud based time tracking solution from Replicon - http://www.replicon.com/time-tracking-softwares.aspx that has well featured technology to get the things done up in an exclusive way.